It has been two weeks since the CDC updated the case count and epi curve on their website. The reasoning is good, because the outbreak of E. coli O157:H7 associated with Romaine lettuce is mostly over and data are arriving more slowly. There is no Romaine lettuce from the Yuma, Arizona growing region being harvested. All Romaine lettuce from the Yuma growing region is beyond its shelf-life and is no longer being consumed. The public health community is waiting for the reporting of any new cases and the fate of those stricken with the illness. It is sad to report that the death count raised from one to a total of five souls. 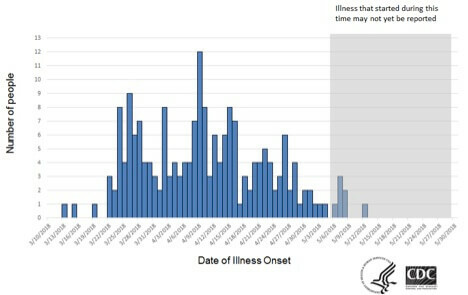 A look at the epi curve shows a normal distribution of cases, a week where the number of cases dwindled to single digits and days without new cases, great signs that the outbreak will soon be declared over by the CDC. An onset time of three weeks is possible coupled with time for medical diagnosis and reporting to CDC means there may be more cases reported. The case count currently is 197. • 89 people have been hospitalized. A hospitalization rate of 45% is high. • Similarly, the rate of patients developing hemolytic uremic syndrome (HUS), a form of kidney failure, is high at 13% for 26 people. • E. coli O157:H7 with the same DNA fingerprint and associated with Romaine lettuce caused illness in Canada. • Illnesses have been reported in 35 states, including Alaska. 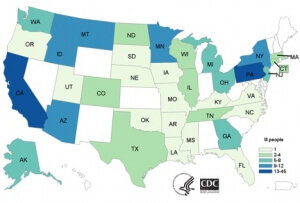 While the CDC continues to monitor the outbreak and many organizations, including the FDA, are investigating, one of the most striking features is that no Romaine lettuce is available for pathogen testing. Because of the typical, long onset time for the illness, any unconsumed Romaine is long discarded. Most outbreak investigations will gather samples from consumer homes, restaurants and grocery stores. In this outbreak, the implicated product availability is very limited. The outbreak investigation is very difficult as illustrated in the traceback model created by the FDA and showing some of the traceback for Romaine lettuce. With no common point of service, distribution center or processor, the source of contamination may be found in the growing region. All this news should cause us to take a hard look at our own recall plans. If your company is audited, mock recalls are conducted at some frequency, and there are always learnings from mock recalls. If you are under compliance for the Preventive Controls for Human Food rule, a written recall plan is required as part of the food safety plan. I encourage you to take time now to review and update the recall plan. From my experience of working with companies on recall investigations, it is better to take time now to be prepared than to be figuring this out during a recall. The ConnectFood website has free resources, and the folks at ConnectFood are here to help! Contact us. June 6, 2018 /by Kathy Knutson, Ph.D.
FREE 30mn Food Safety Plan Consultation! ConnectFood offers a step-by-step, food safety plan generator to comply with the Food Safety Modernization Act and HACCP. On-Demand plan reviews are available from a national network of food safety experts.